Jaded Richard Grindle is the sleaziest clown working the children’s party circuit in Ireland. Arriving late to one birthday, his timing is off, the bratty kids a nightmare and a prank goes horribly wrong - he falls on a kitchen knife and goes to that Big Top in the sky. Years later the same nasty kids attend another more grown up bash. Little do they know, thanks to a black magic clown cult, Stitches will be the uninvited guest of honour seeking revenge on those responsible for his untimely death. Stitches stars comedian Ross Noble in his first feature role and was directed by Conor McMahon (Dead Meat). Opinion regarding its qualities has been divided, even between reviewers on the same site (check out the reviews by Daniel Green and Cleaver Patterson over at CineVue) but it did with the Best Death Awrad at this year's FrightFest, where it had its world premiere. The cast also includes Tommy Knight (Dr. Who) and Gemma-Leah Devereaux (The Tudors). 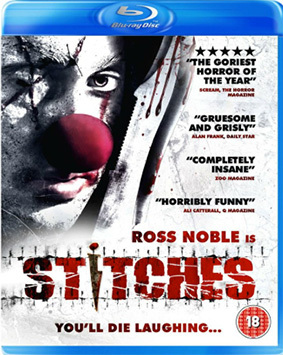 Stitches will be released on UK DVD and Blu-ray on 11th February 2012 by Kaleidoscope Home Entertainment at the RRP of £17.99 for the DVD and £19.99 for the Blu-ray. The only listed extra is a 20 minute behind-the-scenes feaurette.